Suspicions that it was started malicously has possibly strengthened. Sources claim that the fire spread quickly because there was more than one fire. Witnesses stated inter alia, have seen an unidentified jeep coming from a farm between Ojén and Marbella exactly where the fire then got an awesome course. In Marbella, it was announced yesterday that it is now able to restore electricity, water and telephone networks in all affected areas. It is now under the companies just the kind of disruption that is "normal". 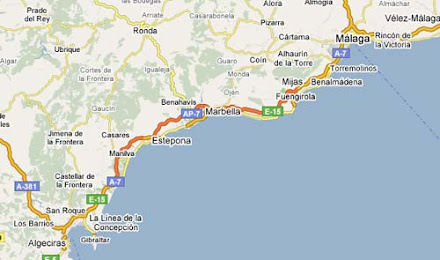 In areas Elviria Ricmar has repaired water pipes, power lines and 3000 meters telephone and fiber optic cable. It has also been launched several campaigns to restore nature and conduct tree plantings. Biologists say that tree planting may be necessary until next year. The hotel chain Fuerte Hoteles has among other things promised to donate a tree for every hotel guest you have in Marbella. The hotels have also started a fundraiser where guests can help by buying a tree, which will then be planted in the affected area. One person was confirmed dead and another missing on Friday night after a major wildfire Affected Municipalities of the Coin, Alhaurin el Grande, Mijas, Marbella and Ojén, in Málaga province. The victim is a British man aged 78 was found Whose charred body in the area of ​​Las Blanquillas, inside the city limits of Ojén. His wife has not yet been found. Meanwhile, a couple in late fifties was taken Their hospital with burns to 60 percent to of Their Bodies. Both lived in a detached home inside the Marbella residential estate of El Rosario. A mother and her two children were found hiding inside a cave in Ojén and taken to hospital to be Treated for smoke inhalation. Five other people Were Also Evacuated from Their Homes. The fire was Extending to the Sierra de las Nieves even as the chief of the firefighting department Málaga, Manuel Marmolejo, Announced That a new front had opened up and Reached the area of ​​Juanar, where two hotels had to be Evacuated. Marmolejo said Extending the wildfire was with "great virulence." The blaze Began around 6.50pm on Thursday and soon extended to a perimeter of Between 50 and 60 kilometers, said Marmolejo. An Estimated 1.000 hectares of land Have Been Affected.